All the strips so far have been great, but with this one you folks have outdone yourselves. The cultists’ dialogue is made of hilarity. Also, the bit about the possessed doll made me think of Blair from Eerie Cuties, although he’s more “pervy nuisance” than homicide-encouraging. I cant belive I didnt saw that one coming, shame on me. Is the one that broke down the door, the same girl who escaped/burned down the convent? 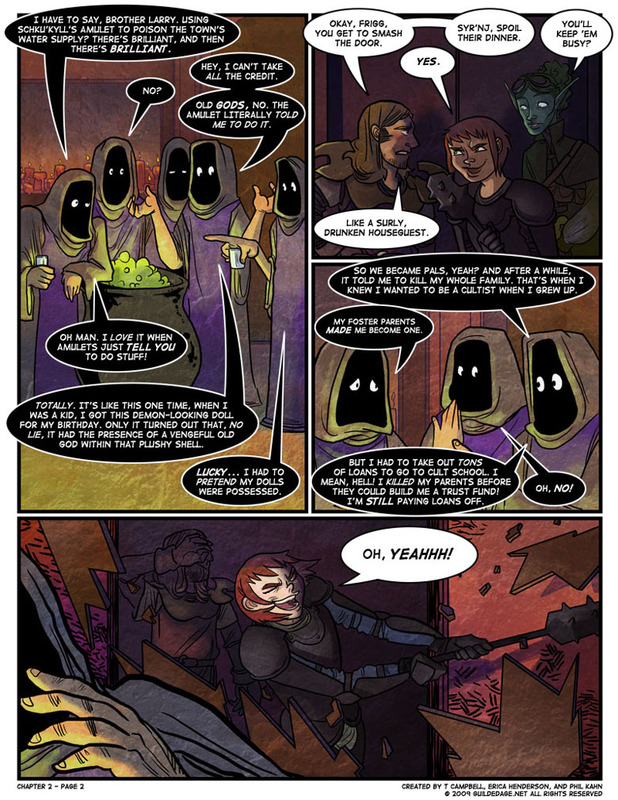 The cultist’s dialogue made me think about Terry Pratchett’s secret society in “Guards! Guards!”. I love Pratchett’s Disc World and probabilly that’s why I came here ecvery day hoping to find a new page. Those crazy cultists and their old gods telling them to kill stuff.When will they ever learned that the end result is that theyâ€™re either going to get face raped by that same old good or killed dead by a group of heroes? Truly, there are not enough Kool-Aid Man references in the world. :) Friggin’ love this comic. Keep up the great work. Just had to register to comment on the Schylkill reference. If you want a poisonous water supply, I’ve lived near few that would be a better choice (maybe Lake Michigan in the ’70’s). So which of the authors is from SEPA? Kool-Aid Man reference? OH YEAH! Was Bandit Keynes not introduced in the first chapter along with the rest of the characters? :/ Did I miss her? Good god, this comic is made of win. Thank you, o trio of trouble, for the tribulations you visit on the three + two tribe of terrestrial termegants known as a ‘party’. Am i the only one who sees a KoolAid reference with the whole “Oh NO!” followed by “OH YEAAAAAAAAAAAH!” ? Maybe you should read previous comments. Also I now want to enroll in cultist school. Damn, the art on this page is super great. Like it’s jumped a whole nother level in terms of coloring. After I first read this comic I could never remember the name, but always wanted to go back to it and read more. When the name was posted on Erfworld today I was ecstatic. I think your comic is great. Keep up the good work! Schulkyll!! it’s so true!! Our water tastes like crap. You know, even though her armour is designed solely to offer protection and not to show off her curves, Frigg is still the hottest fighter I’ve seen in webcomics like this. And so Soti sits alone in the corner, sniggering at the name “Syr’nj”… and not getting the “Kool-Aid” references because he is too British. well now i want to make kool aid are you happy?